Pet tag or key chain--your option! Your canine (or feline) BFF deserves some bling. They will be the envy of the dog park—or catio—when they sport this 1½″ colorful replica of the state park shield on their collar. Hard enamel coated with a protective epoxy dome. Sturdy and stylish. Suitable for engraving on reverse. Want to keep the bling for yourself? 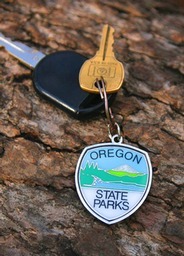 The tag comes with two split rings for use as a key chain.